What is a Bunion and how to treat bunion pain? The most important exam for testing for neuropathy is the neurological physical examination in the office. This exam consists of deep tendon reflex, proprioceptive exam, sharp and dull touch, warm and cold temperature testing and vibratory sensation. All these simple tests can tell us important information that doesn’t require expensive tests, MRIs, or biopsies. There are mainly 2 different types of sensory nerves in the foot, large fiber and small fiber (2 sub-types). The small are composed of two sub-types, the C fiber that is thin (diameter 0.4-1 micrometer) and unmyelinated (no insulator or myelin). The second type is the more rapid, thinly myelinated A-delta fiber (1-5 micrometer in diameter). Both carry types carry pain sensation and others (intense pressure, cold, and others depending on the receptor type). The large fibers carry touch and pressure as well as joint position sense. These fibers are myelinated, hence faster in conducting impulses from the periphery to the brain. When you touch a hot plate for example, you will feel pain/hot right away, that is the A-delta fibers, and then later (seconds or minute later) you feel deep achy burning pain, that is the slow C fiber. EMG/NCS (nerve conduction studies) measures only the faster (large nerves) and does not exclude the possibility of small fiber neuropathy if it is normal. Therefore, to test the small nerves you will need a ENFD as shown below. An electromyogram (EMG) is a test that is used to record the electrical activity of muscles. EMGs can be used to detect abnormal electrical activity of muscle that can occur in many diseases and conditions, including muscular dystrophy, inflammation of muscles, pinched nerves and peripheral nerve damage or neuropathy. Nerve conduction velocity test, also called a nerve conduction study, measures how quickly electrical impulses move along a nerve. It is often done at the same time as an electromyogram, in order to exclude or detect muscle disorders. 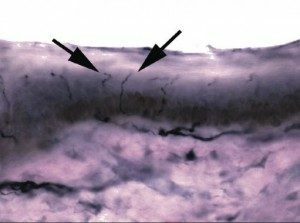 Epidermal nerve fiber density testing is the analysis of a 3mm punch biopsy of skin to quantify the number unmyelinated C‐fibers and myelinated A delta‐fibers within the epidermis (see description above). Because the skin has a relatively consistent number (or density) of epidermal nerves at each anatomic site, and this density is consistent between different genders and age groups, a density below the normal curve is indicative of small fiber peripheral neuropathy. Degenerative changes within epidermal nerves may be predictive of neuropathy prior to the onset of symptoms. Meet Dr. Dennis Timko Surgeon podiatrist.